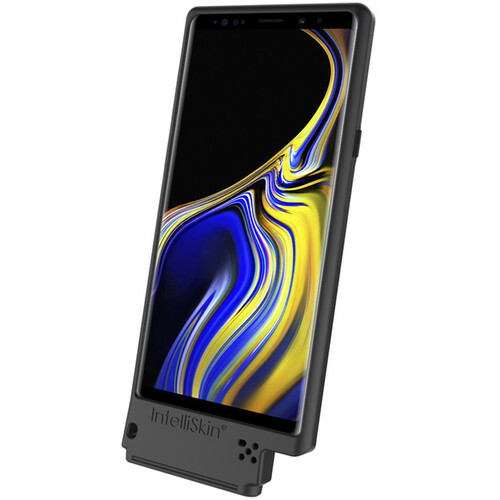 The RAM MOUNTS IntelliSkin is a protective sleeve with military grade drop protection and GDS technology for your Samsung Galaxy Note9. This sleeve features an integrated GDS connector that is molded directly into the skin, which is designed to prevent damage to your device's charging port when docking. Moreover, it is molded with ruggedized contacts on the exterior of the skin, so you can dock easily in field applications. This version of IntelliSkin features an opening port that allows for easy removal and storage of the Note9's Pen. It is also compatible with a variety of USB Type-C desktop, vehicle, and GDS Snap-Con docks.